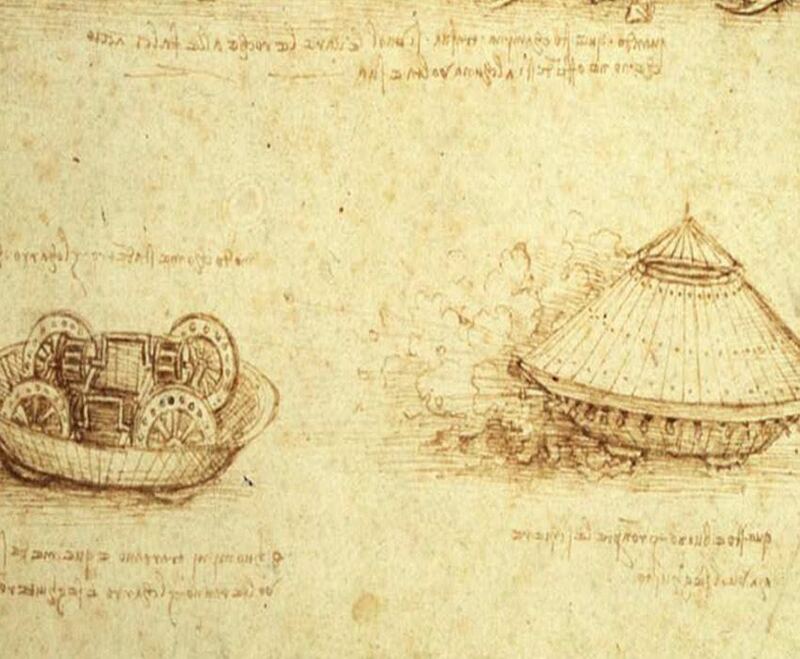 From the proto-machine gun to the first robot, the inventions of Da Vinci changed the world. 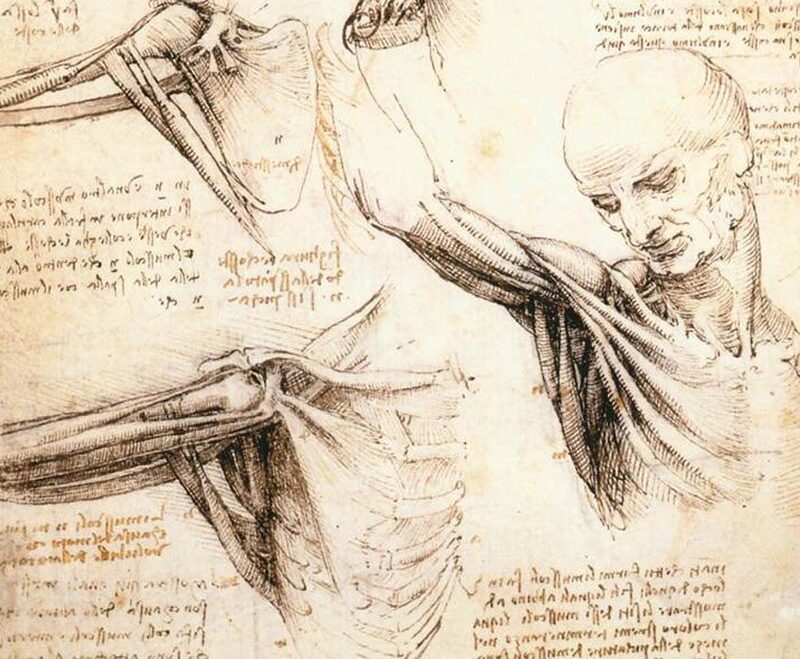 Leonardo Da Vinci may be the ultimate jack of all trades. 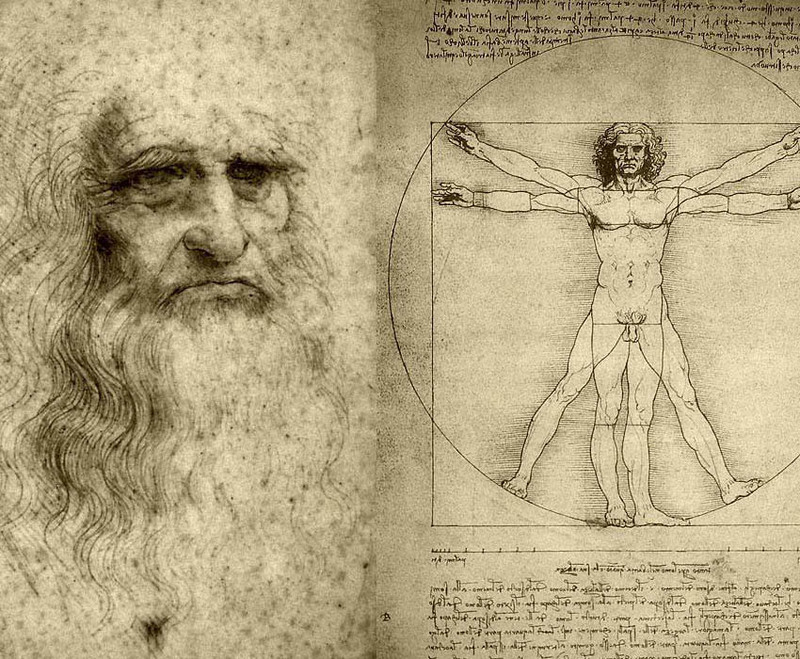 Indeed, artist, inventor and scientist are just some of the titles that Da Vinci held during his 67-year long life. And while Da Vinci lived a handful of centuries before we were even thought of, it is many of his forward-thinking prototypes that have provided the foundation for the most innovative inventions in recent memory. 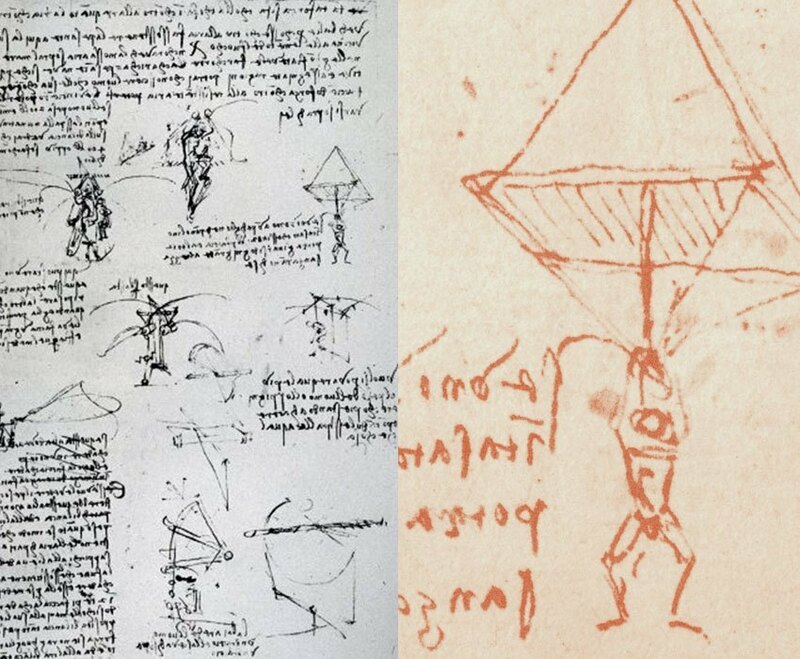 Forever fascinated by the possibility of flight, Da Vinci spent much of his time thinking up ways to get mankind in the air–and perhaps more importantly, how to get them back down safely. A razor-sharp mind might be a nation’s best national defense mechanism, so it should come as no surprise that Da Vinci’s was employed by the military to find ways of increasing its chances in warfare. 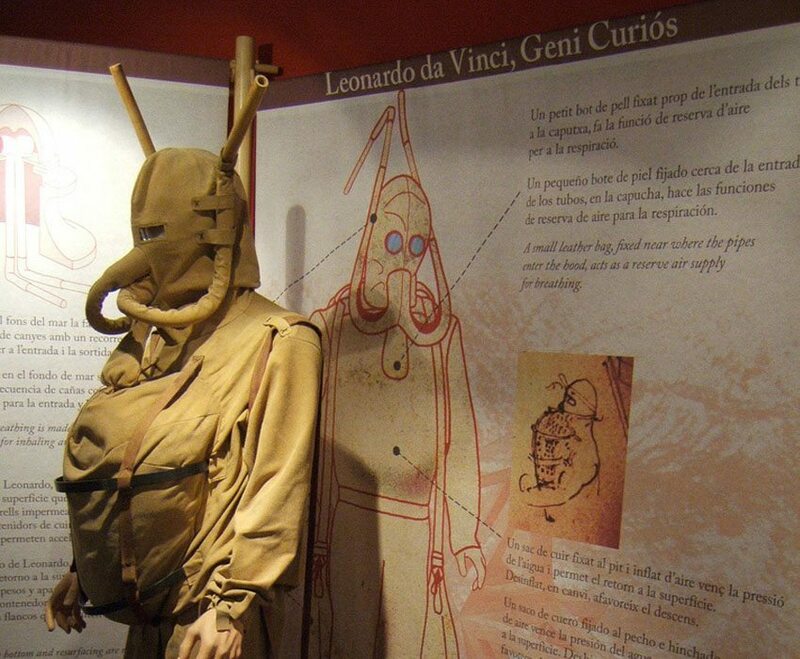 Originally designed as a way of warding off invading ships, Da Vinci’s diving suit would allow men to engage in a little underwater sabotage by cutting holes in the bottom of the enemy’s hull. 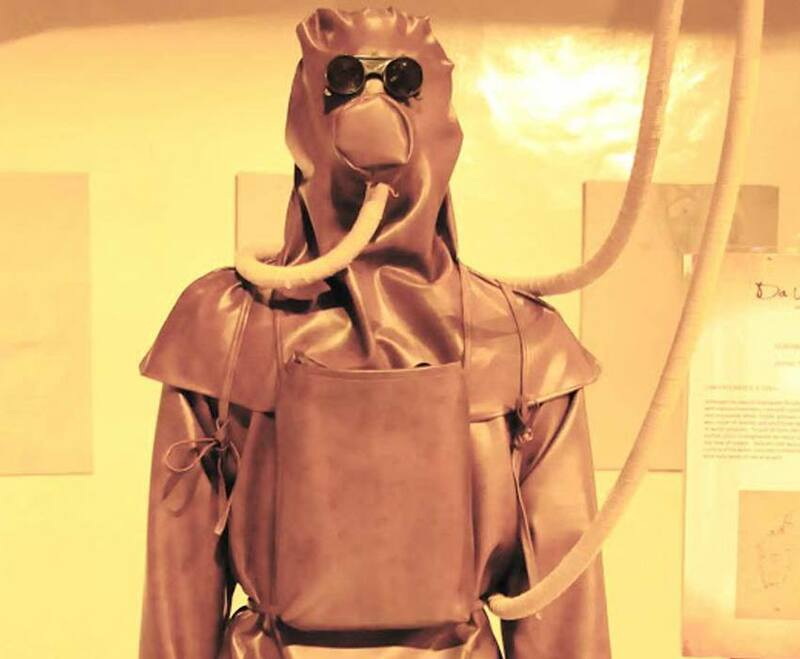 Unfortunately, the design, complete with breathing hose and glass goggles, wasn’t needed at the time and would only find itself submerged in planning stages. 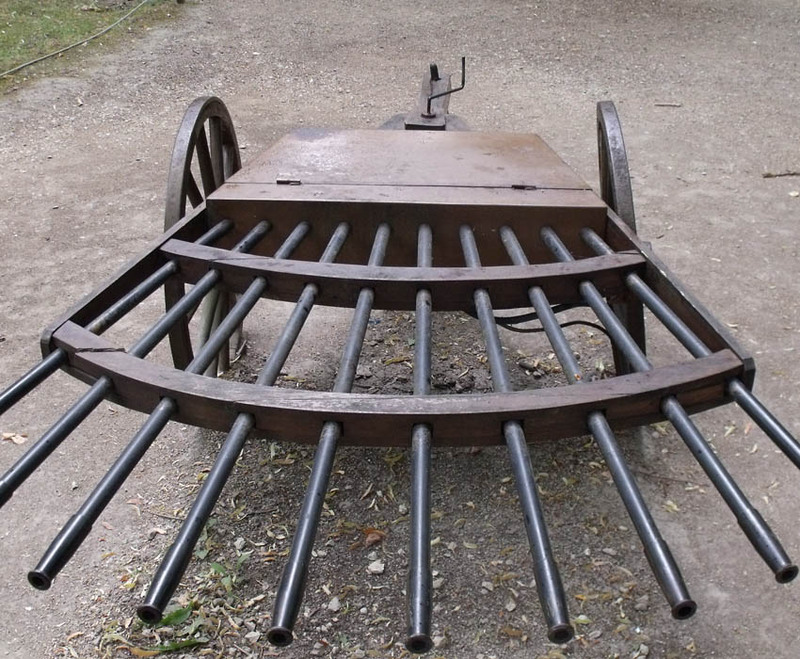 Yet another of his dastardly warfare designs, Da Vinci was the first person to design an armored tank. While working for the Duke of Milan, he created an armored war machine, complete with 36 guns to be driven by eight men. In theory, it was virtually invincible. However, the diagram contained an error: the gears caused the front and back wheels to move in opposite directions. 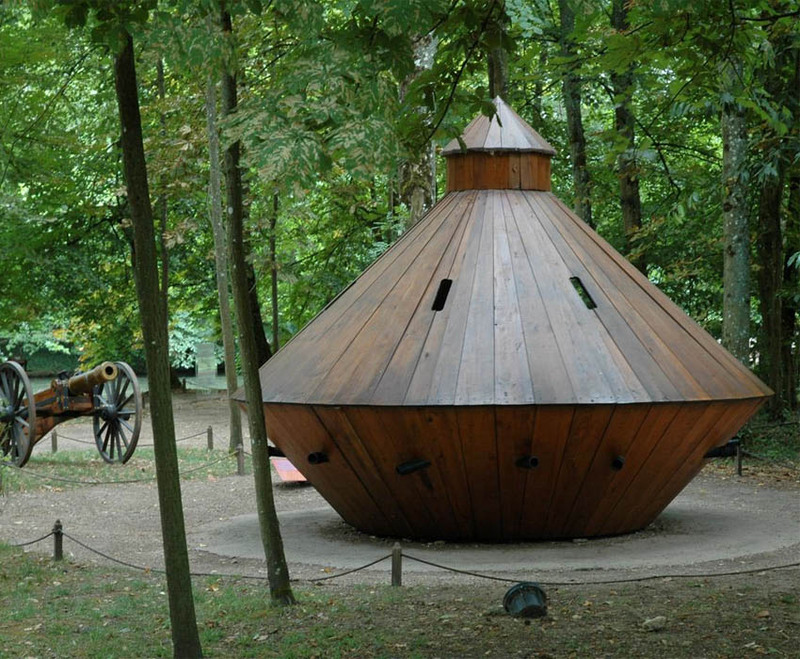 Incredibly, historians doubt that it was an error made by mistake; rather, they believe it might have been a strategic design tactic that rendered Da Vinci himself as the only person who could properly assemble the tank, thus keeping the tank out of enemy hands. For those of you who have spent a good amount of time clocking up hours on Assassin’s Creed, you might recognize this next astounding invention. 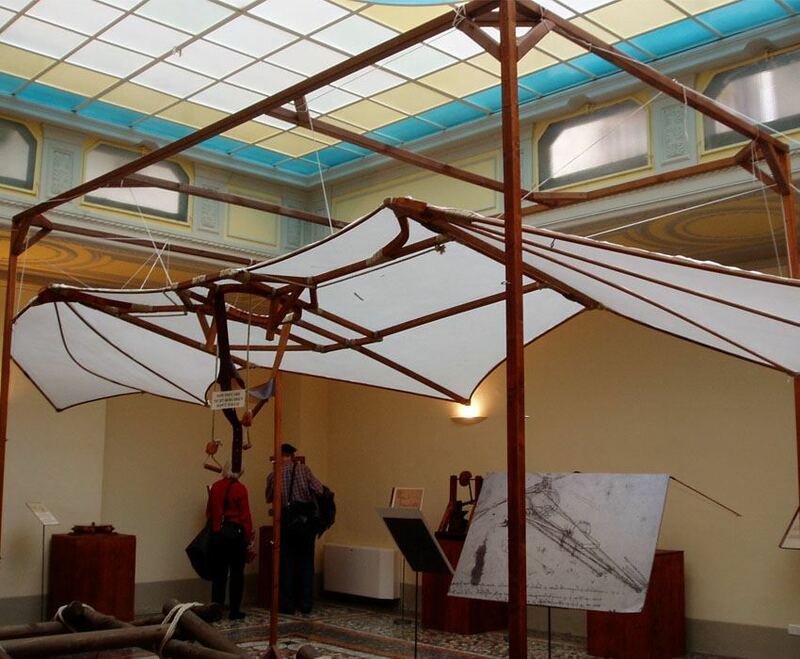 The flying machine, otherwise known as the ‘Ornithopter’, took its inspiration from bats and birds. 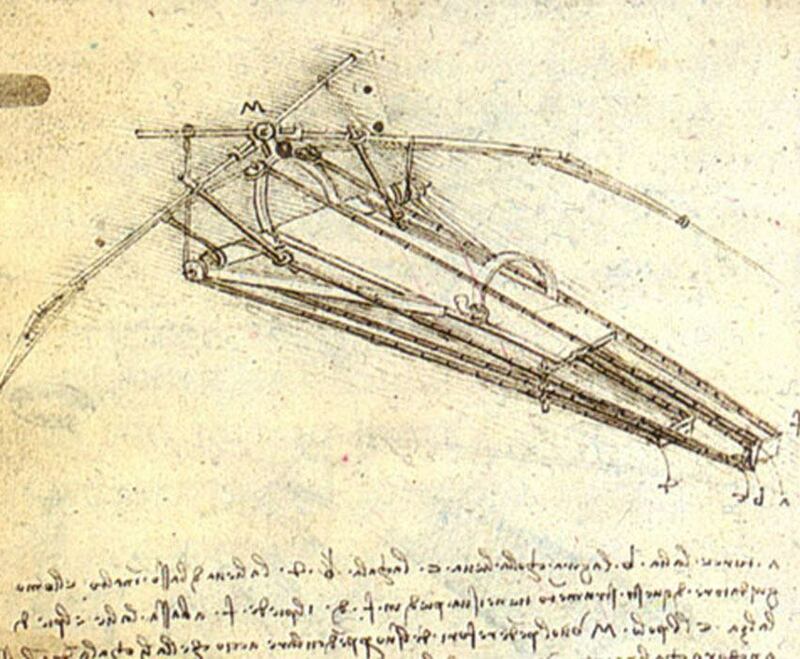 Da Vinci designed a machine where the pilot lay down in the center and pedaled a crank, connected to a rod-and-pulley system, to get the machine moving. Once in the air, the wings were designed to flap, much like a bird’s. Sadly, the necessary tools to bring the apparatus into flight were not available at the time, and the machine’s flying days were spent less like a falcon and more like an ostrich. Given his assemblage of homemade artillery, Da Vinci’s hatred of war and “killing machines” seems a bit counterintuitive. But like so many who engage in morally-compromising activity, Da Vinci did so only because he was desperate to support his own household. 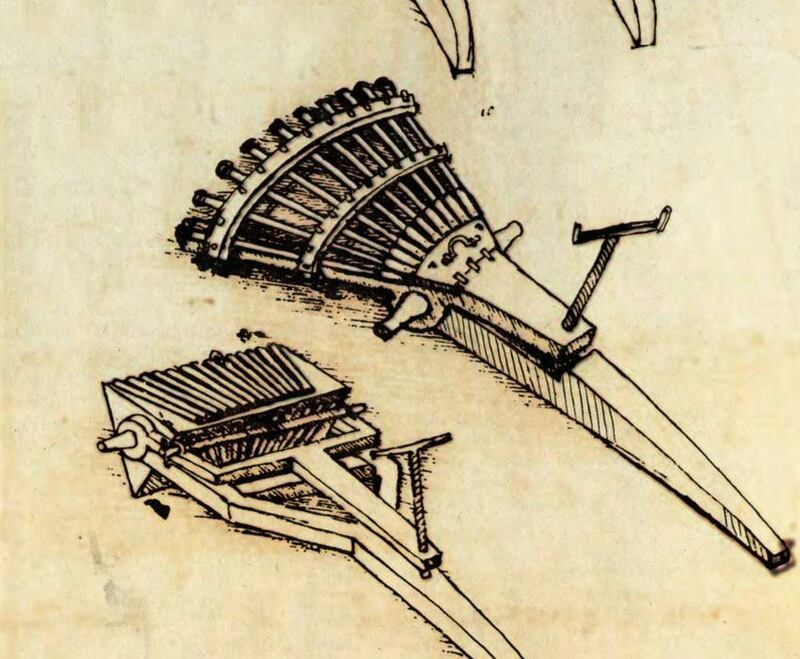 The machine gun was yet another of Da Vinci’s deadly designs that never came to fruition, but it certainly would have destroyed any incoming enemy. Not quite the same as a modern machine gun, Da Vinci’s ’33-barreled-organ’ allowed a set of 11 muskets to fire one after another, rotating to allow the barrels to cool off. 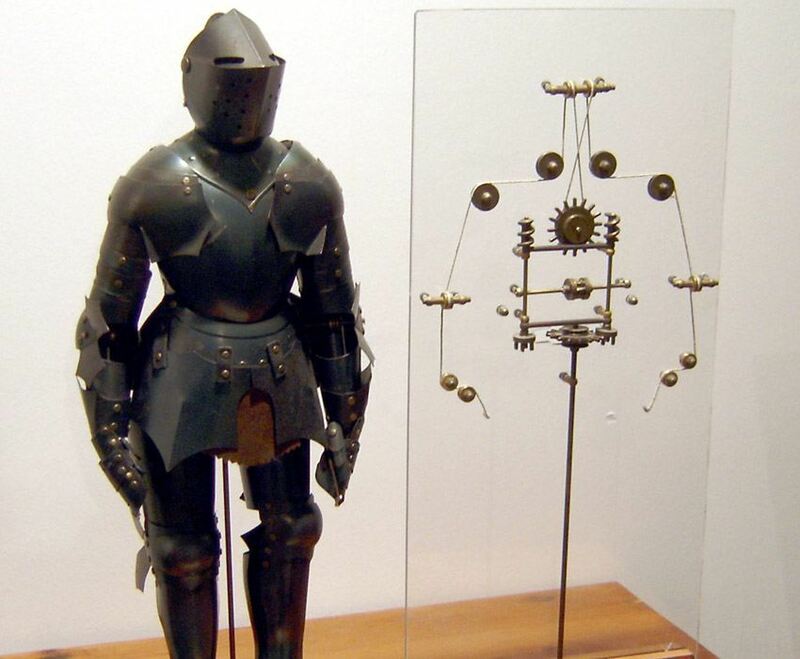 While there are dozens of Da Vinci’s inventions that never saw the light of day in the 15th century, it is his robotic knight that would have been truly terrifying. 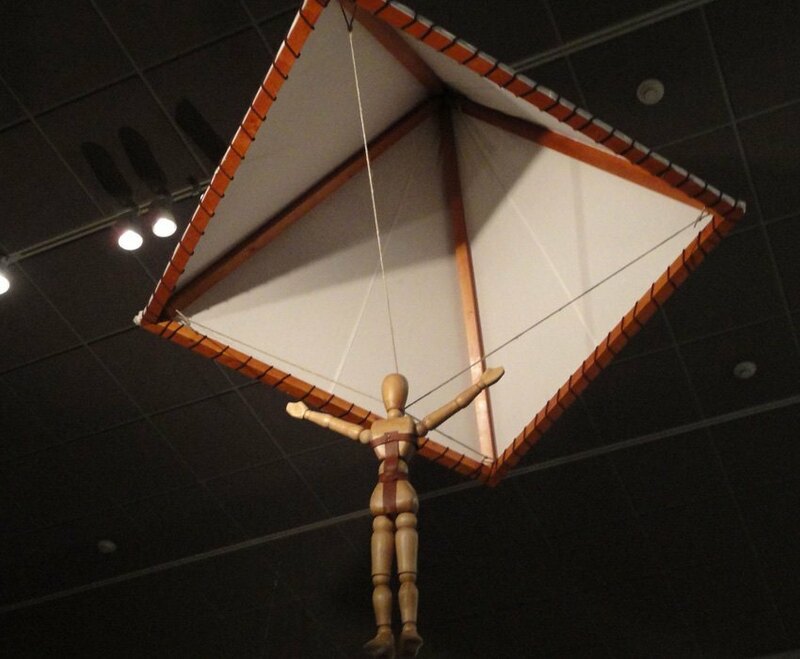 The first humanoid robot, Da Vinci drafted this gear, wheel and cable-filled giant for a pageant in Milan. 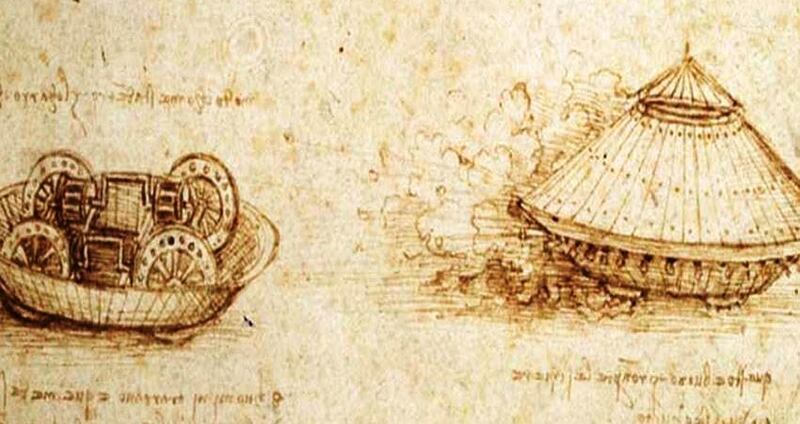 According to Da Vinci’s drawings, some of which have never been recovered, the robot could sit, move its head and even lift its visor on its own. Intent on finally bringing one of Da Vinci’s lost robots to life, Minnesota-based Mark Rosheim spent a whopping five years pouring over Da Vinci’s manuscripts and ultimately recreated his futuristic vision. The final product, complete in 2002, was able to walk and wave. Rosheim used this as inspiration for his robotic designs for NASA, demonstrating the timeless nature of truly innovative design. For the secrets behind Da Vinci’s most famous painting, check out these facts about the Mona Lisa.